Hugo Calderano is a professional table tennis player from Brazil. He is born on June 22, 1996, in Rio de Janeiro. He competes for Brazil at the 2016 Summer Olympics. At 20 years old, he is one of the youngest competitors at this level (World Ranking 15). He has also won the Men’s Singles competition for the 2017 ITTF Pan America Championships. Recently, Hugo Calderano has made a huge show off at the ITTF Qatar Open 2018 and the World Tour Grand Final 2018. Recently, in the ITTF World Tour Grand Final, Hugo Calderano has beaten the World Ranking #1 Fan Zhendong 4-2. Such a great performance! Hugo has won Lin Gaoyuan (Chinese superstar and number three seed) 4-0 (11-9, 11-8, 11-3, 11-6). Hugo also defeated world ranking number one Timo BOLL 4-1 in the round of 16 and then Tomokazu HARIMOTO 4-0 in the quarterfinals. It’s not the first time that Hugo won Timo Boll. He has already won Timo Boll in German League. Hugo’s playing style is very aggressive. He stays rather close to the table, and initially attack with his “special backhand”. His playing style is rather similar to Dimitri Ovtcharov. He uses a lot of backhand flick, and backhand topspin counter-attack. His standing position is parallel, which is used by a backhand favorite player. Hugo served very well. He used a very high toss serve. His serve is rather tricky (with the same motion, he can produce “no spin serve”, and heavy underspin serve”. At Qatar Open 2018, Lin Gaoyuan can’t read well his serve to the forehand side. It’s not easy to flick the high toss serve of Hugo. And Lin Gaoyuan has fallen into the “trap” of Hugo. Fast backhand attack and counter attack! Once in the rally, Hugo has a huge advantage with his “gifted” backhand. Hugo can attack “down-to-the-line” with his backhand. This type of attack is not easy. And he has surprised many players (Lin Gaoyuan, Harimoto Tomokazu). To counter this quick backhand style, you need to change the placement. If Lin Gaoyuan has varied the spin, and the placement, it will be different. Playing against the powerful, high-risk shots player like Hugo, you need to be patient, use more soft-balls, and short ball to the middle. This can help you slow down the game. Hugo Calderano is the youngest ever Pan American Games Men’s Singles winner. In the final match between Hugo and Fan Zhendong, he almost wins the first 2 sets. Hugo’s counter-attack is so powerful, at the same level of top Chinese players. Lin Gaoyuan has failed into the trap of Hugo, but this time, Fan Zhendong has to beware of that. Hugo lacks a little bit of experience at the crucial moments. Fan Zhendong plays a lot of soft balls, and heavy underspin ball to the middle in the 3rd and 4th set. Each time Fan Zhendong attacks, he aimed at the elbow (near the middle) of Hugo. This cost him the match 0-4. If Hugo variates his style at the end of set 1, and 2. One short push, and one backhand flick. “Be more patient”, he could win the first 2 sets. Fan Zhendong has adapted very well, in the last set, Hugo can do nothing versus Fan Zhendong. Hugo has such a crazy fast backhand counter attack. But Chinese Team has learned a lot after the game of Hugo vs Lin Gaoyuan. 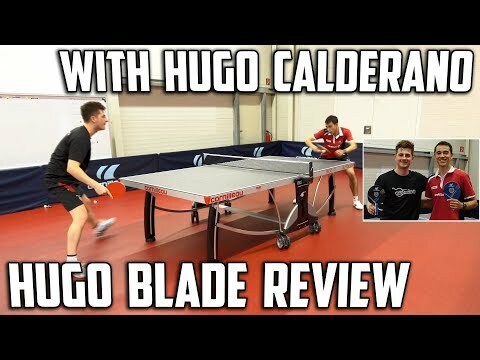 Blade: custom blade with “extra stiff plywood in the middle” of his Hugo Calderano FOCO OFF+ (check price/ read review/ search product) for more rigidity to fit closer to his special game. Notice that this custom blade wouldn’t fit any player instead of the regular Hugo Calderano FOCO OFF+. Cornilleau also confirmed that “Hugo adopted Target Pro GT rubbers for a long time now” (read the comment below). 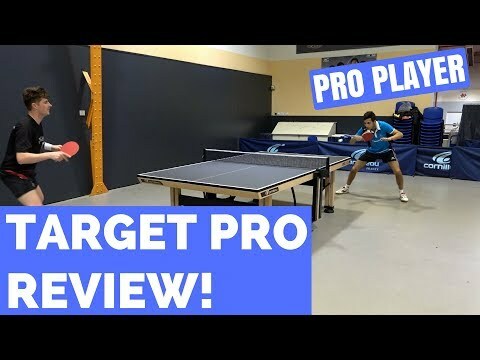 Cornilleau Target Pro GT Rubber Series Review with Can Akkuzu! But be careful about this information, because it’s provided by the sponsor. In fact, Hugo is sponsored by Cornilleau (France). He is on the same team with Simon Gauzy. On mytabletennis forum, some players have confirmed that Hugo didn’t play with Cornilleau Target rubber. It’s well-known that many top players used a custom blade with a different handle. They use the “handle” provided by the Sponsor Manufacturer as they signed the contract with the company. For example, Fan Zhendong is using “Viscaria blade” with Stiga handle (because he is sponsored by Stiga). You can clearly see that the center ply is like the “Brown-Dark wenge wood”. It’s not the Cornilleau Gatien Conquest, because the center ply is not the same. Meanwhile, the center ply of Gatien Absolum is rather “light red”. Hugo is using a custom blade made by Cornilleau. This version is faster and harder than the commercial one. The Cornilleau blade has much brighter color center wood. Look at this Gatien Origin. Here is another photo, which shows the wood composition of Hugo’s blade. The blade doesn’t have the “light red” color like Cornilleau Absolum Off+. The color is darker, black color). Hugo Carderano Player’s racket the center material is black, which seems to be different from the most similar is Gatien Absolum. It seems that the blade of Hugo has a similar composition of the custom handmade OSP Palatinus Ultimate blade (Check price/ Read review). Cornilleau Team has confirmed that “the Darker Inner Ply” is the custom Cornilleau blade, with harder, and faster wood ply. You can also observe that the professional player would change the handle. There is on the market, a blade called as “HUGO CALDERANO FOCO OFF+” with the blue handle. So Hugo will use the blue handle of Hugo Foco, but the blade inside is not the same. HUGO CALDERANO FOCO OFF+ is not the blade used by Hugo! Hugo is using the custom blade provided by Cornilleau. For the rubber, some players say that Hugo is using the Tenergy 05 instead of Target Pro GT. But with the white sponge, it seems that Hugo is using Target Pro GT rubber (or Joola Rhyzm similar rubber). Note: Professional can try and change often their equipment. For amateur player, it’s much more important to focus on “how to develop your technique“, than “what is the equipment that pro plays“. he is apparently NOT using tenergy rubbers. tenergy has orange/red sponge, while he has clearly white on both sides. white sponge have Target Pro 51 and Rakza. So I would say he IS using Target rubbers. You are right, Roman. Cornilleau Target Pro GT X51 or Target Ultim 50 has white sponge. Hardness about 50 Euro hardness. Thank you, I’ve corrected the article. The end of the handle does not look like that of a Gatien or the OSP Palatinus Ultimate in the picture just above the OSP Palatinus Ultimate where the caption talks about the center ply. It’s the handle tag. They can change, or remove the tag. The most important is the inner composition of the blade. We appreciate the interest you have about Hugo Calderano and his equipment but we are really sorry to read some false information and regret that you spread theses without clearly verified them. Hugo adopted Target Pro GT rubbers for a long time now, you can see it if you watch closely his matches or pictures. For the blade Hugo is trying a custom blade with an extra stiff plywood in the middle of his Hugo Calderano FOCO OFF+ for more rigidity to fit closer to his special game. Notice that this custom blade wouldn’t fit to any player instead of the regular Hugo Calderano FOCO OFF+. In any case Hugo plays with other brand equipment. We would stay at your disposal for more information. Thank you Cornilleau. Due to the lack of information, we are trying to find the correct information. We have contacted Hugo, but maybe he is too busy to answer. I will correct the information. It could enhance its credibility. Yes, the professional blade that Hugo used is not the same as the commercial one. Cornilleau has confirmed that. I have seen that Hugo has an association with Xiom now. Is it just the rubber or is he using another product from Xiom?